There are several seaplane companies in Victoria based in downtown. They all offer scenic tours. Pat Bay Air main base is not located in downtown. However its location with close proximity to Vancouver Island International Airport ( YYJ ) and competitive pricing makes it special for many Victoria BC Visitors. "Pat Bay Air Cessna 185 (Attribution: Viccoastdog at en. Wikipedia)"
Seaplane tours are popular Victoria tourist attraction. Since 2005 Pat Bay Air has joined the Victoria Seaplane force and offers Variety of scenic tours and Charter tours from Victoria, Saanich Peninsula and Gulf Islands. Flight seeing tour gets you the most memorable and enjoyable flying trip ever. You will not forget the stunning views of Victoria city, Ocean, wild animals, flying over Butchart garden and returning to the Saanich peninsula with exciting water landing. All year around Patbay air offers scenic seaplane tours from Patricia Bay Seaplane Base right next to YYJ. 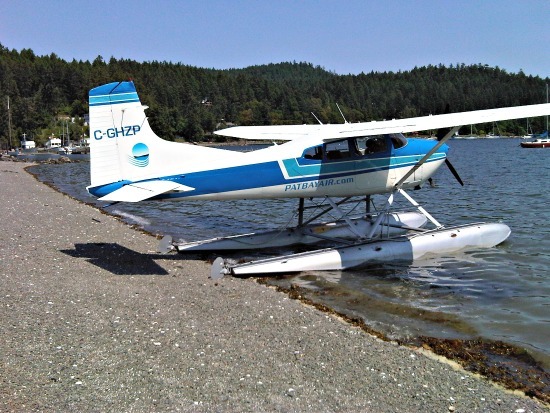 During summer months (June through September) there is also an option to fly from Victoria downtown inner harbor Hyack Floatplane Terminal, which is a few blocks from Harbour Air Kenmore Air terminal. They are the Victoria charter plane experts. Prices are very competitive and affordable. There are many advantages of chartering an airplane. First thing comes to our mind is these flights do not operate on a strict schedule. We make our own itinerary fill the plane with as it has seats for and fly to many destinations other flights won't take us. Pat Bay Air supply charter service to many locations such as fishing lodges, spas and resorts in Vancouver island, and other neighbor islands. We can create our custom charters at affordable prices. Pat bay air Private charter flights start from the Pat Bay Seaplane base or the Cowichan base to locations where you want to reach. For a group of friends or family can easily charter a Pat Bay Air seaplane to create their own Victoria BC tour with a customized flightseeing adventure. Pat Bay Air is not only the experts at charter flights and flightseeing planning. They conduct seaplane training in Vancouver Island as well. They provide all year around training. Their training includes Ocean, lakes and river environment and flying with other commercial Floatplane areas in the air space. They offer different options of training courses to choose. They are very happy to help with accommodations and other arrangements for visiting pilots. You need to hold a foreign or Canadian Private Pilot License and Medical Certificate. If you hold a foreign Pilot License with valid ICAO license and medical certificate, All you need is to obtain a Limited Term Pilot License (LTPL) from Transport Canada for flight training purpose. This can be obtained within a few hours from Transport Canada office at Victoria International Airport ( YYJ ). Pat bay air assists foreign pilots with LTPL procedure too.